Lobster Ravioli with Vodka Cream Sauce: Can you think of anything that sounds better? I dare you to try and think of anything better than that… because it doesn’t exist. And the addition of freshly-made home-cooked ravioli is the icing on top of the cake. For Valentine’s Day I decided to pull out all the stops and treat my man to this indulgent dinner to really make him feel special. What better time than Valentine’s Day to test out the new pasta making machine? Although I got the pasta maker at Christmas I hadn’t had a reason to use it until now. A part of me was intimidated; what if I sucked at making pasta? But I found it surprisingly simple once I got the hang of it. The stand mixer makes it super easy to make the dough, and then you just form it discs and feed it through the machine and you’ve got pasta dough in no time. You can have fresh pasta quicker than the time it would take to run to the store! Now that I know how to use it I’ll be doing it much more often regardless of whether it’s a special occasion or not. I debated for a while what I would make for Matt for Valentine’s Day. I thought a nice steak dinner at first but I don’t trust myself with pulling off a phenomenal filet. Also, Matt treated me to a nice Greek dinner the night before and he always spoils me at restaurants, so I wanted to really show my appreciation but putting in a lot of effort and trying some new things. I ultimately decided on pasta because I wanted to use my new machine, but also I know that Matt will never be disappointed with pasta. 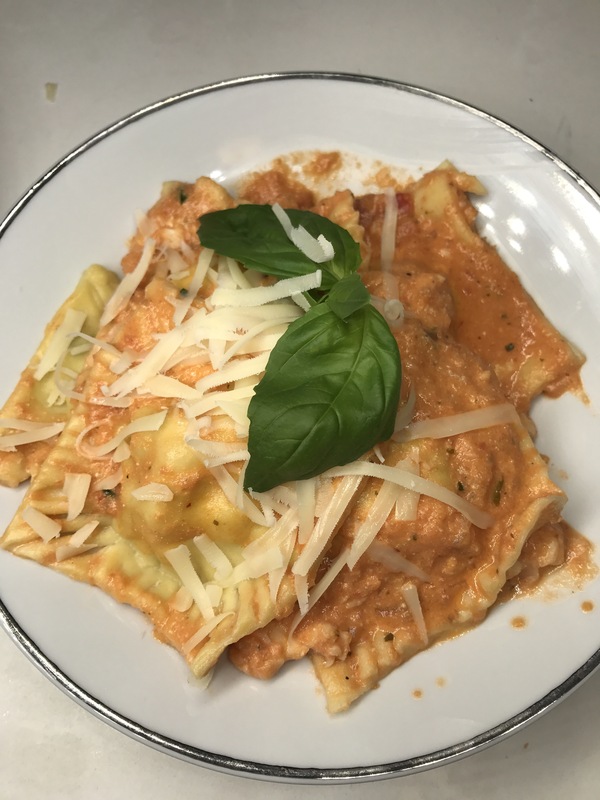 One of his favorites is lobster ravioli, and another favorite is penne alla vodka, so why not combine the two? I ended up browsing dozens of recipes on Pinterest and eventually decided on following the recipe for the raviolis from Rachel Donahue from eHow (see the original here), whereas I based my sauce on the recipe from Rosalba R. on Food52 (get her recipe here). Of course I made some minor adjustments to suit my taste and the ingredients that I wanted to use. I was really impressed with how everything turned out but I think if I made it again it would turn out even better. First off, I didn’t defrost my lobster tails properly and ended up having to use the microwave, which probably resulted in some tougher lobster meat once everything was cooked. I was also rushing through the filling so I didn’t chop the lobster finely enough. Second, since I was taking so long making the raviolis I think the dough started to toughen and thicken, and I think if I had made them faster with fresher dough they would have been lighter. 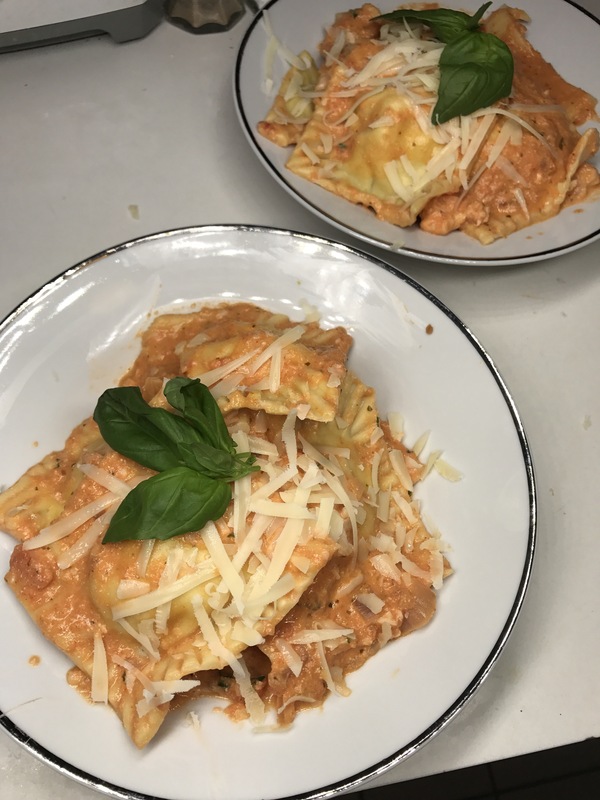 I also made a LOT of filling; I only used half of it for all the raviolis! So at the end I didn’t want to waste the filling and just dumped it in with the vodka sauce to make it extra lobster-y (which turned out being pretty good.) The recipe below will reflect the measurements that I should have used (and would have been much cheaper, too). All in all, I don’t think Matt noticed any of these imperfections and literally stuffed himself with about a pound of pasta. 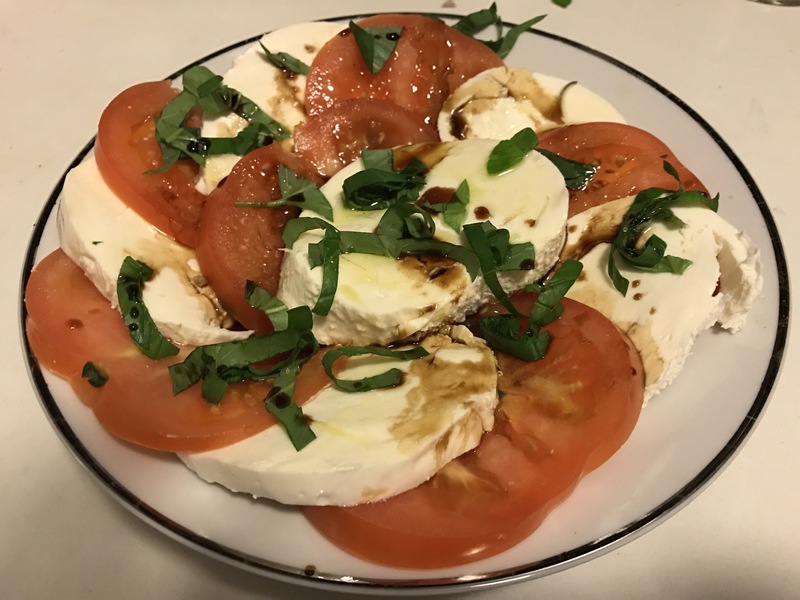 Of course I had to have an appetizer to really knock Matt’s socks off, so I opted for a fresh caprese salad with a drizzle of my truffle balsamic vinegar that I got in Florence. I made Matt his own huge plate and he looked so happy when he realized it was all for him! And then for dessert I had baked some brownies with red sprinkles and topped it with Ben & Jerry’s Half-Baked ice cream. We were in legitimate comas after eating it all. In a stand mixer add the flour and salt and mix on low speed. Slowly add the eggs until fully incorporated with a paddle mixer and the Tbsp of water. Then change the paddle for a dough hook and mix for 2-3 minutes until the dough is smooth. If the dough is too dry add another Tbsp of water or two until the dough is sticky and fully mixed. Wrap in plastic wrap and refrigerate for 30 minutes. Once the dough has rested separate it into 4 balls. Flatten each ball and run it through the “2” setting on your stand mixer pasta attachment to roll it out. Fold this in half and run it through again. Continue folding the dough over and running it through until it is elastic and takes up the full width of the pasta machine. Flour as necessary. Run the dough through the “3” and “4” settings to thin it completely. First, defrost the lobster tails overnight in the fridge or by placing under running cool water for 30 minutes or so. Once fully defrosted place the tail in a pot of boiling water and boil for 8 minutes, until meat is cooked through. Remove the lobster tails and let cool. Once cool remove the meat from the tail and finely chop it. Heat the butter in a sauce pan and sauté the shallots until translucent. Remove from heat and place in a mixing bowl along with the parsley, ricotta, parmesan, lobster meat, and salt and pepper. Refrigerate. When pasta sheets are ready, lay one sheet out on a floured surface and put about 2 tsps of filling spaced evenly apart, and lay another sheet of pasta on top. Cut out squares in-between the centers of filling, and firmly press the edges of the raviolis together using your fingers or a fork. Make sure to try and press the air bubbles from the center before closing. Repeat until all dough and filling is used. To cook you will place these raviolis in a pot of salted boiling water until they float, about 4-5 minutes. Transfer the raviolis to sauce immediately. Heat butter in a large saucepan over medium-high heat. Add shallots and cook until translucent. Add the cup of vodka and flambé this (I don’t flambé often — it took a few minutes for the alcohol to burn off completely and was a bigger flame than usual, but I think it was normal). After the alcohol has burned off add the can of whole tomatoes and crush the tomatoes either with your hands or with a wooden spoon. Add the basil, bay leaves, and red pepper flakes. At this point, taste your sauce for seasonings and add salt and pepper. If your sauce is tart or bitter from the tomatoes you can add sugar in. Simmer for at least 20 minutes, then puree with an immersion blender. After the sauce is pureed to the desired consistency, add in the cream and simmer for an additional few minutes. At this point, add in your freshly cooked ravioli to the saucepan and immediately grate some fresh parmesan on top of the raviolis before you coat with the sauce (this helps the cheese stick to the ravioli which will flavor each bite). Then coat the raviolis with the sauce. Plate the raviolis and spoon additional sauce on top. Serve with more cheese and more fresh basil. ENJOY!